When installing a new gutter system, most homeowners are looking for one that is not only effective but also requires little maintenance and will last for years to come. While copper and aluminum are still the standard choices for these systems, vinyl is quickly becoming a popular material customers are turning to. In fact, many see it as a complete solution for controlling all of their rain water run-off needs. Its dependability and resilience make it an appealing option for those seeking a sustainable choice in exterior supplies and materials. And vinyl gutter systems tend to stand up well to the elements maintaining its attractive appearance and further enhancing the home’s curb appeal. Adding value to the property, this upgrade is an overall great investment and an option you will want to share with your customers. When it comes to materials that offer the best in both function and durability, few can compete with vinyl. Although a popular choice for siding, it can also be used in a number of other exterior applications including gutter systems and accessories. Vinyl has become a popular material in gutter systems for both professional installers and homeowners alike for a number of reasons. Today’s vinyl gutter systems are constructed of premium vinyl resin offering a durable and enduring finish. Homeowners enjoy its resistance to rust and corrosion creating a beautiful appearance that lasts for years. Contractors find that vinyl gutter products are lightweight and easy to work with making installation a breeze. And at GutterSupply.com, all of our vinyl gutter products feature a urethane seal making them both leak-proof and easy to install. Like their aluminum and copper counterparts, vinyl gutter systems come in many color and style options sure to compliment any home’s exterior. GutterSupply.com offers a full-line of vinyl gutters and accessories in both a 5” K Style Traditional system and a 4” & 5” K Style Contemporary (U-Shaped) system. The traditional profile offers a simple, classic appeal while the contemporary line features clean lines with a modern aesthetic. Both the traditional and contemporary styles come in brown and white color options. 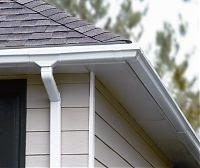 At GutterSupply.com, we carry all the vinyl gutter systems and accessories you need to complete the job along with the standard aluminum, copper, and steel options. As the leading online supplier in the industry, we offer the largest selection of gutter tools and supplies all at an exceptional value to our customers. Click here to learn more about the large selection of vinyl gutter products we offer or contact us at 888-909-RAIN.